Flood risk can be a problem even before any flooding event may have occurred. If a property is found to be at any risk of flooding in the future it has become increasingly difficult to obtain suitable insurance, a mortgage or even to market and sell a property. These are some of many factors which could harm your investment or diminish the value of your property. There are many potential causes of flooding, from climate change to man made watercourses bursting beyond their means. Rising sea levels and increasingly frequent severe rainstorms together with an ever greater need for housing and development means that the risk of flooding is likely to increase with time. Flooding is, to a degree, a normal part of nature. It is neither technically feasible, nor economically affordable, to completely prevent all risks to all properties. The Environment Agency’s current aim is, therefore, to reduce flood risks where practical and to minimise the harm caused by flooding as far as is reasonably possible. This means that great care must be taken when choosing to buy or develop any property. The Environment Agency estimates that one in six homes in England are at risk from flooding. Of these, 2.4 million are at risk from flooding from rivers or the sea. 3 million are at risk from surface water flooding from drains, sewers and run-off. 1 million are at risk from both. Some flooding from natural sources may be attributed to climate change. However, flooding from man made drainage which is over-subscribed, poorly planned or maintained is an increasing risk. This was well documented by the 2014 floods on the Somerset levels. This large scale flood resulted from over subscribed drainage and poorly maintained rivers combined with an extreme weather event. These and other human factors contribute to the flooding epidemic now faced by the UK. Changes in land use, building houses on flood plains and paving over natural surfaces, are making people more vulnerable to flooding. A recent European Environment Agency report has said that climate change could contribute even more to this problem in the future. However, for now, land use changes remain the primary reason behind rising flood damage costs in the UK. 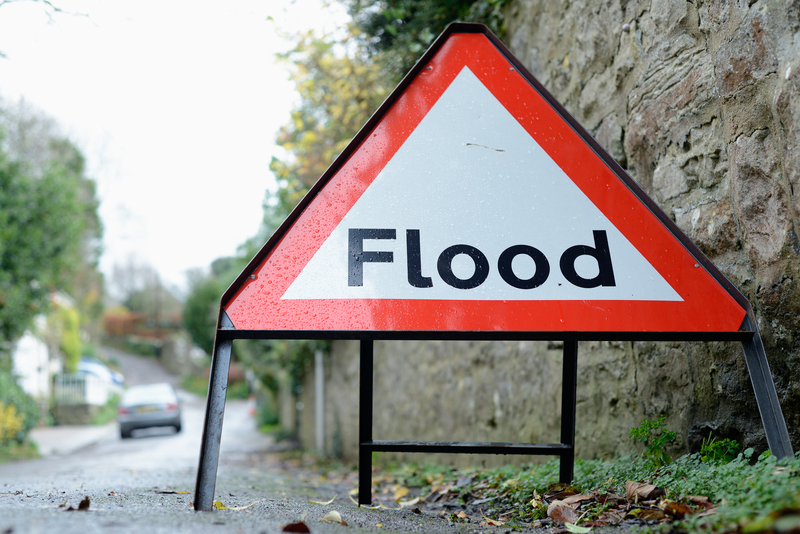 It may not always be so obvious that a property is potentially at risk of flooding. You do not need to be close to a river, live by the sea or even on low lying ground to be exposed to a flood risk. Surface water, groundwater and overflowing sewers are increasingly common causes of flooding and, unfortunately, these problems may occur anywhere. The most common type of flooding consists of surface water flooding from overwhelmed drains. There is also groundwater flooding where the ground becomes too saturated to cope. Other issues include flooding from failed drains and, of course, coastal and river flooding from mass volumes of water. These are all factors that we at the Commercial Law Practice pay a special attention to. In June 2013, the government agreed a Memorandum of Understanding (MOU) with the Association of British Insurers (ABI). This MOU was an agreement to develop a not-for-profit flood insurance scheme. This scheme is known as Flood Re and is now force. The Flood Re scheme aims to ensure that household insurance will be affordable for those at an increased risk of flooding. The scheme only applies to domestic, residential property at this stage. You can find a list of insurers participating in the scheme by following the link here. The scheme also incorporates the government’s new action plans for the effected areas. The plan is to help reduce flood risk to below ‘significant’ levels within five years. It does this by levying an annual contribution upon all insurers to create a central fund. This fund then meets the additional costs of any flood claims. Ultimately, is intended to ensure that homeowners whose properties are at a higher flood risk can obtain affordable flood insurance. Here at the Commercial Law Practice we check these factors automatically on behalf of our clients to ensure that we provide you with both the best quality information available as well an exemplary service. We can also obtain independent searches and reports regarding the risk of flood faced by any individual property.